Escape to the tropics and explore the wonders of the rainforest in the Bolz Conservatory. 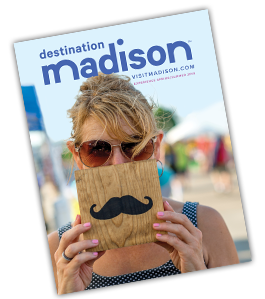 Get an insider's view of this indoor tropical oasis and discover the plants, stories, and people that make it one of Madison's most iconic places. As you smell, touch, and taste your way through this guided sensory tour, you'll encounter plants both familiar and unique. From towering palm trees to tiny carnivorous plants, more than 650 species of tropical plants call the Conservatory home, along with a rushing waterfall, free-flying birds, and colorful koi. At the end, enjoy a signature cocktail created with ingredients derived from rainforest plants. You will take home a souvenir glass along with recipes for more botanically inspired drinks. • You are welcome to bring a water bottle, if desired. • Upon arrival, proceed to the Visitor Center Lobby where a guide will meet you. We'll offer this experience to the public every Thursday at 5 PM from October - May. Perfect for individuals, couples, or small groups of friends! • Experience will be held rain or shine and will be cancelled only in the event of dangerous lightning. Do you have 9 or more friends? Are you a member of a book club or church group? Family visiting? Out of town wedding guests? Wow them with a private Garden to Glass tour! For private group reservations, we'll also offer a morning version of the tour finished with a tropical-inspired cold-brew coffee drink in place of cocktails. To schedule a private group experience, call 608-243-0156 or send an email to olbrichexperiences@cityofmadison.com. At least two weeks notice and a 50% deposit are required at the time of booking. • A non-refundable deposit of 50% of the anticipated expense will be due at the time of booking. • The final payment and final numbers are due 3 business days prior to the visit date.